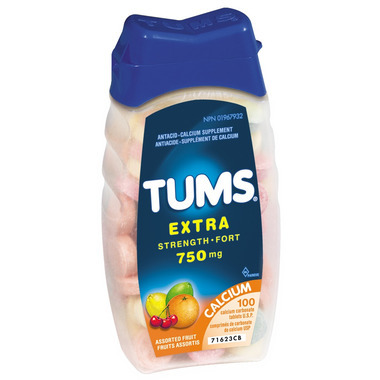 Tums Extra Strength provides fast and effective relief from indigestion, heartburn, and upset stomachs. It's also an excellent source of Calcium. Uses: For fast relief of acid indigestion, heartburn and sour stomach caused by excess stomach acidity. ANTACID Directions: Adults and pregnant women: Chew 2 to 3 tablets as needed. Do not take more than the recommended dose or for longer than 2 weeks. If symptoms persist beyond 2 weeks or recur, talk to your doctor. Maximum: Adults: 10 tablets/day. Pregnant women: 5 tablets/day. CALCIUM SUPPLEMENT Directions: Adults and pregnant women: Chew 2 tablets after meals or as directed by your doctor. Maximum: 5 tablets/day. Non-Medicinal Ingredients (in alphabetical order): Adipic acid, artificial and natural flavours, corn starch, FD&C blue 1 Al. lake, FD&C red 40 Al. lake, FD&C yellow 5 Al. lake, FD&C yellow 6 Al. lake, mineral oil, sodium hexametaphosphate, sucrose, talc. Warning: Do not use if allergic to any of the ingredients or take within 2 hours of another medicine because the effectiveness of the medicine may be altered. Calcium may affect absorption of other medicines. Ask your doctor before use. only need these when im pregnant, can't live with out it!